This is a really yummy dish that I adapted from one Shay made while I was visiting her in Denver ! I just chop up a couple of bunchs of asparagus, and some spring onions. I line a baking dish with non-stick baking paper and just spray a bit of olive oil on top of the veggies before putting them in a hot oven. ( or you can do in the broiler but I find they are more tender done in the oven ) I just watch them but usually it takes about 10/15 minutes for them to be done (tender but not mushy !!). 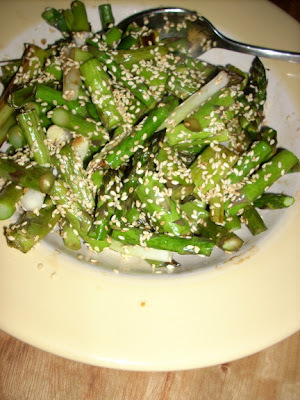 To serve, top with soy sauce, balsamic vinegar, sesame oil and sesame seeds. I do this to taste, I start by filling half a cap full of each ... it's a subtle flavor, don't go overboard ! 1. I have served this on top of sliced grilled red bell peppers ! And topped with avocado ! 2. I have served on a bed of fresh baby spinach or rocket (arugula) ! 4. I don't always add the sesame seeds to the top !